The transporation of goods and materials in Britain in the early 1800s relied mainly on the use of animals, such as horses and mules. These were used to pull canal barges or haul tramroad trucks. Steam power was in use for stationary engines. However, the development of this technology was making headway. 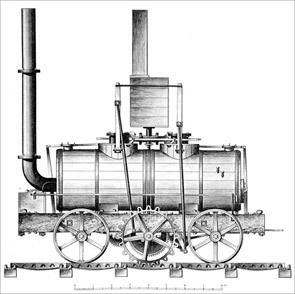 In February 1804, Richard Trevithick's (1771-1833) groundbreaking Penydarren locomotive underwent trials in South Wales. The engine pulled a train of wagons more than 15km on iron rails, transporting cargo and passengers, and demonstrating for the first time that steam-powered locomotion was achievable. Steam locomotives require coal, making their use at collieries a natural pairing. Christopher Blackett (1751-1829), owner of Wylam Colliery, where Stephenson's father had worked, saw the potential and commissioned a locomotive from Trevithick. Unfortunately it was judged too heavy for Wylam's timber tramway and it stayed at the Pipewellgate Foundry in Gateshead where it had been constructed. Author Samuel Smiles (1812-1904) reports that around this time, George Stephenson "was induced to leave his situation" as brakesman for the winding engine at Willington Quay dock for a similar position at the West Moor Colliery. The 219m deep pit, between Killingworth and Longbenton, was one of many operated by the Grand Allies, a cartel of wealthy families who owned and controlled much of the northern coal trade. The partnership had been formed in 1726, with founder members Hon. Sydney Wortley Montagu (1650-1727), Sir George Bowes (1701-60) and Sir Henry Liddell (1708-84). In late autumn 1804, the Stephenson family moved to a house in a terrace called Paradise Row at West Moor, just north of Newcastle. The house had one ground floor room only, with a garret reached by ladder. Stephenson's wife Frances was by then suffering from consumption (tuberculosis), for which remission was possible but there was no cure. The move and a second pregnancy seemed to improve her health for a while. The possibilities of steam locomotion were the basis of much discussion at Paradise Row. L.T.C. Rolt (1910-74) tells us that among those taking part were Robert Hawthorn senior (1760-1842) and John Steel (1781-1818). Steel had helped construct Trevithick's locomotives in the north east. Between 1805 and 1808, it seems Trevithick himself visited Stephenson on several occasions, as he claimed to have dandled the young Robert Stephenson (1803-59) on his knee "many a time". On 13th July 1805, Frances gave birth to a daughter of the same name. Unfortunately, joy turned to tragedy when the baby died after only three weeks. Frances continued to decline, and she died on 14th May 1806, aged 37. 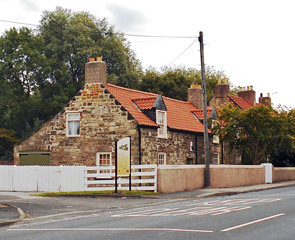 Mother and daughter were buried in St Bartholomew's churchyard at Longbenton, 2.4km from West Moor. Stephenson sought a change of scene. He left Robert, not yet three years old, in the care of housekeeper Ann Snaith (c.1787-1826) and set off for Scotland on foot. He secured a job in Montrose on the east coast at Ford's Flax Mill (completed 1805) as engineman for two Boulton & Watt steam engines, of 9kW and 18.6kW. One of them pumped water. Among the improvements he made was the prevention of abrasive grit from entering the pumping engine's pipework. He lined its sump with timber, allowing water to pass through but not the wet sand into which the well was sunk. Evidently the job was well paid, for he managed to save £28. Returning on foot to Killingworth during 1807, he found his parents in need and his son gone. Old Bob, his father, had been blinded and scalded by steam in a boiler house accident and was unable to work. Stephenson paid his parents' debts of £15, moved them from Jolly's Close to a cottage in West Moor and gave them money to live on. Little Robert had not gone far — he was living with Ann Snaith. Taking up his former post at West Moor Colliery, Stephenson brought Robert back to Paradise Row. Following a brief spell with an unnamed resident housekeeper, they were looked after by his sister Eleanor Stephenson (1784-1847) who had been jilted by a faithless suitor. It was an ideal arrangement. She ran the household, mothered her nephew — and became an ardent Methodist — while her brother resumed clock mending and cobbling shoes to supplement his income. In spare moments he made model engines and tried unsuccessfully to devise a perpetual motion machine. On 26th March 1808, Stephenson’s brother Robert (1788-1837) married Ann Snaith at St Nicholas's church, Newcastle. Despite this happy event, Stephenson — probably for the only time in his life — became depressed, and considered moving to America. That same year, Stephenson and two other brakesmen began contract work at West Moor for the Grand Allies, in addition to their normal duties. In the meantime, the Napoleonic Wars (1803-1815) continued between France and various European powers including Britain. Able-bodied men were required as soldiers, and Stephenson's name was drawn in a random ballot. To avoid joining the militia he paid £6 for a substitute. Whether he wanted to or not, he could no longer afford to emigrate. Another call on his finances was schooling for his son — Stephenson was adamant that Robert should have the best education possible. Robert attended Thomas Rutter's school in Longbenton, taking the miners' picks with him to drop off on the way for sharpening and collecting them on the way home. In 1810, the Grand Allies sank a new shaft, Killingworth High Pit, and installed an atmospheric pumping engine of the Smeaton-improved Newcomen type to dewater the workings. The engine used a lot of coal and after nearly a year had not gotten rid of the water, which piqued Stephenson's interest. Based on his observations of the pumping engine, he confidently offered to have the pit pumped dry within a week. Colliery manager Ralph Dodds (1792-1874) invited him to try. Foreseeing that his efforts would be resented by the regular enginewrights, Stephenson selected his own team. They worked for three days in 1811 — raising by 3m the tank supplying water to the boiler, shortening the cylinder by packing its base with timber, enlarging the injection valve and doubling the working steam pressure from 34.5 to 69kN per sq m (5 to 10psi). The modifications enabled the engine to use steam and atmospheric pressure to drive the piston down, with condensation in the cylinder at the end of the stroke forming a vacuum to pull the piston up — and with it the water. In effect, the engine was now double-acting. Initially, the pit was so full of water that hardly any engine power was needed to draw it up. Out of balance, the see-sawing of the engine's heavy iron beam shook the engine house alarmingly. As the water level dropped, the power required increased and the engine settled into a steady rhythm. In three days the pit was dry. Stephenson received an immediate payment of £10 from a grateful Dodds. The shaft was later deepened by 30.5m and kept clear of water using the same engine. In April 1811, Nicholas Wood (1795-1865) was apprenticed to Dodds at the instigation of Sir Thomas Liddell (1775-1855), one of the Grand Allies and Wood's father's landlord. 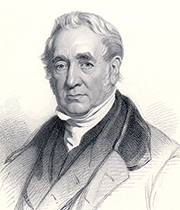 The well-educated younger man would forge a strong friendship with the intuitive Stephenson, with whom he would collaborate on many projects connected with mining and railways. Another family wedding took place at the end of the same year, when Stephenson's elder brother James (1779-1847) married Jane 'Jinnie' Cummins (1790-1829) at Bishop Middleham in County Durham on 1st December. The Grand Allies had noted Stephenson's success but another opportunity to use his skills was not immediately available. However, in 1812, the colliery's enginewright George McCree met with a fatal accident. Stephenson was promoted and given responsibility for all the Newcastle-area colliery machines owned by the Grand Allies. His salary was £100 per year and he was given his own transport in the form of an Irish horse called Squire. Two extra rooms were added to the Paradise Row cottage and, according to John Cordy Jeaffreson (1831-1901), he also lived rent-free and was supplied with coal. Stephenson set to work improving productivity underground. He adapted a stationary steam pumping engine to haul coal up a sloping mine gallery, a task previously handled by pit ponies or children. Killingworth eventually had three subterranean haulage engines, known as Geordy, Jemmy and Bobby after Stephenson and his brothers. They pulled coal trams up to 1.4km along the mine passages to a shaft where coal baskets (corves) were lifted to the surface by a winding engine. In 1813, he was also working in partnership with two Killingworth brakesmen, George Dodds and Robert Weatherburn, providing enginewright services on contract. This was not part of his Grand Allies employment, though it's not clear whether it was a continuation of the 1808 freelancing, or a separate enterprise involving different partners. Away from the mines, the ongoing campaigns of the Napoleonic Wars resulted in escalating prices for horses and fodder, adding impetus to the discussions of mechanics and self-propelled locomotion in Stephenson's parlour. It was the right moment for an alternative to horse power. Machines of varying effectiveness began to appear on existing colliery wagonways, including the engines Salamanca (Matthew Murray [1765-1826], 1812) at Middleton Colliery in Leeds, and Puffing Billy and Wylam Dilly (both William Hedley [1779-1843], 1813) at Wylam Colliery. In September 1813, Sir Thomas Liddell asked Stephenson to make a locomotive in the West Moor Colliery workshops, one of which was conveniently located behind Paradise Row. He immediately began to design and construct the steam locomotive Blücher, which first ran over Killingworth's iron-railed wagonway on 25th and 27th July 1814. It became the most successful travelling steam engine that had ever been put to work. 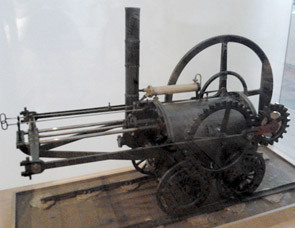 Driven by James Stephenson, the unsprung two-cylinder locomotive managed to haul 30.5 tonnes uphill at 6.4kph (4mph). While Blücher was taking shape, the youngest of Stephenson's siblings, Ann (1792-1860), married John Nixon (1790-1830) on 29th May 1814. They followed the lead of many working class couples of the period, and fulfilled Stephenson's earlier ambition, by emigrating to America and settling in the rapidly industrialising city of Pittsburgh, Pennsylvania. Stephenson had suffered bereavement and come through a difficult period in his life. He was able give his son the educational opportunities he had missed out on himself. Through observation, practice and persistence he had mastered the operation of stationary engines and created a commercially viable steam locomotive. Railway history could have been very different had he crossed the Atlantic instead. Model of Richard Trevithick's (1771-1833) Penydarren locomotive, the world's first steam locomotive to run on rails. Paradise Row terrace, West Moor, north of Newcastle. In 1804, the Stephenson family moved into the end house, later known as Dial Cottage after the sundial above the door, which was made by George Stephenson with his young son Robert. Matthew Murray's 1812 steam locomotive Salamanca, built for the Middleton Colliery Railway, Leeds. It had two cylinders and was designed to work using rack propulsion. It pre-dated Blücher by two years. William Hedley's steam locomotive Puffing Billy, one of two engines he built in 1813 for Wylam Colliery. 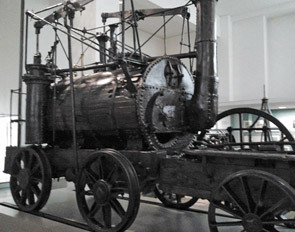 Puffing Billy is now in the Science Museum, London. 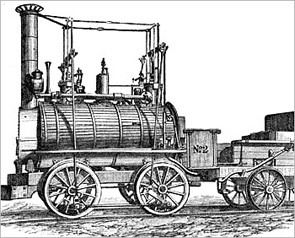 George Stephenson's first steam locomotive, Blücher (constructed 1813-14), built for Killingworth Colliery where he worked. The two-cylinder unsprung engine was the most successful of the early locomotives. However, it did not survive — Stephenson seems to have recylced its parts. Blücher was named after Prussian field marshal Gebhard Leberecht von Blücher (1742-1819).